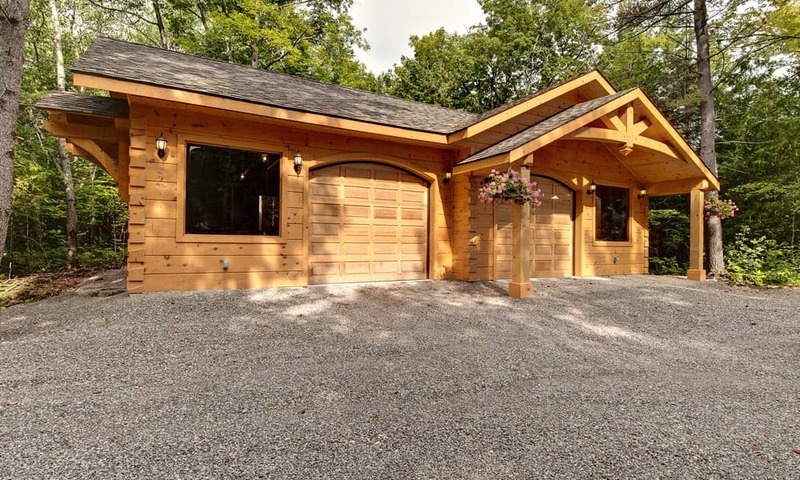 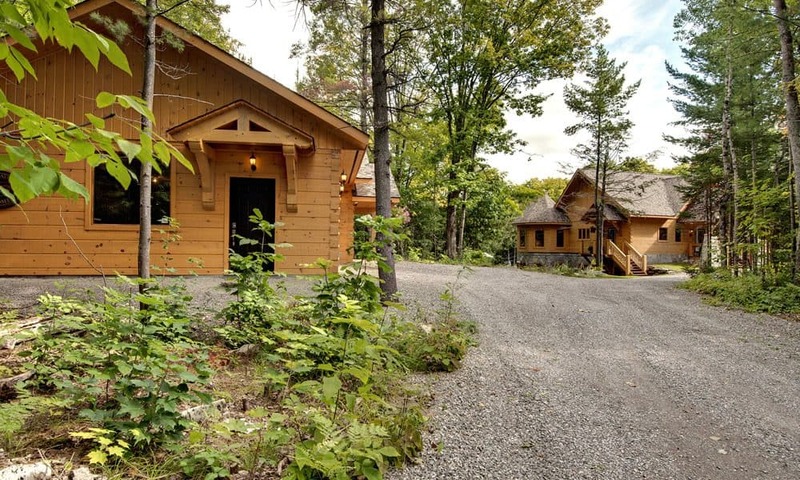 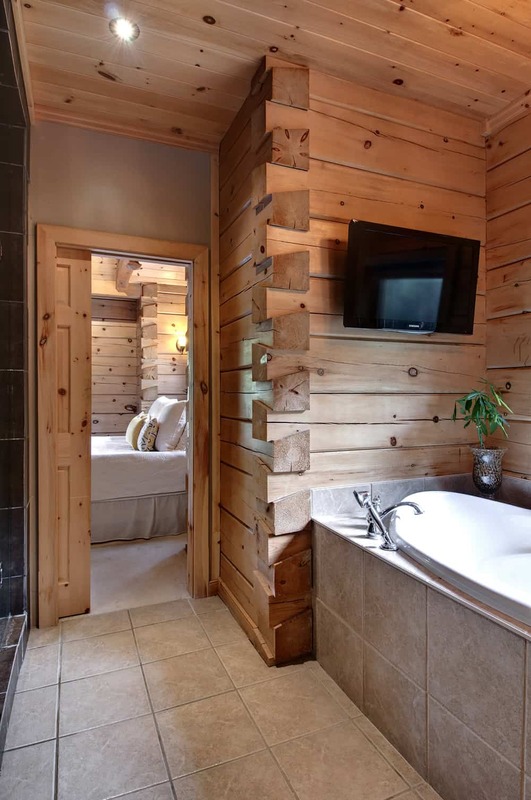 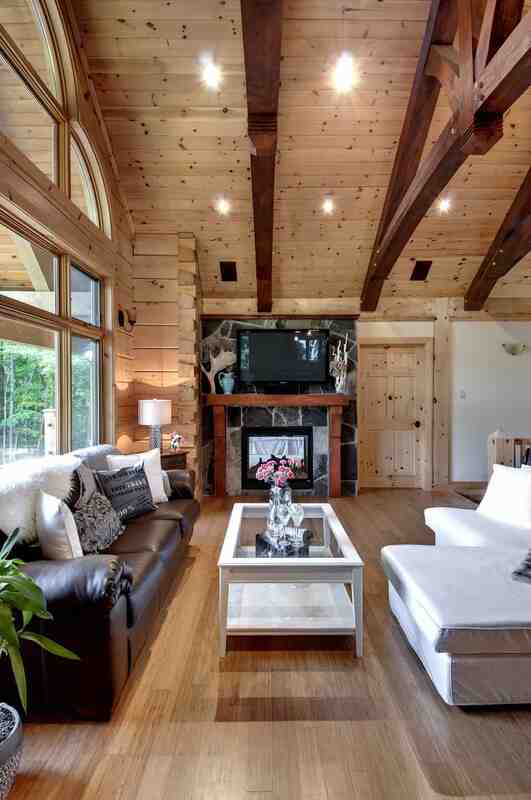 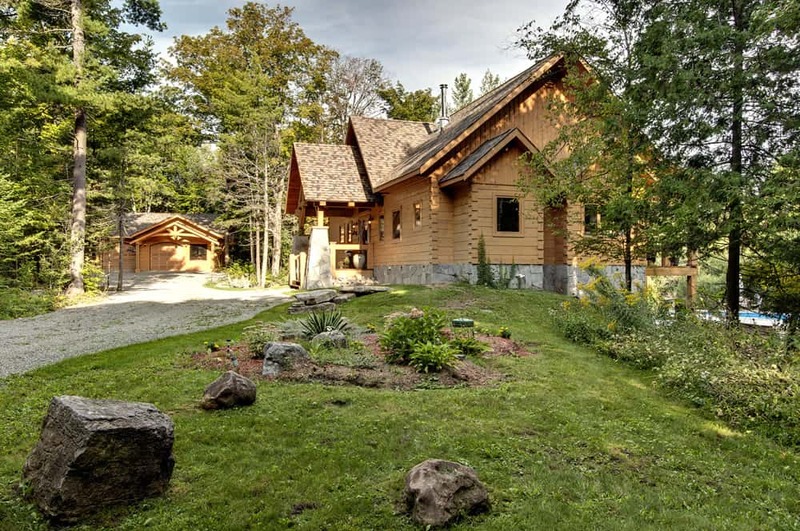 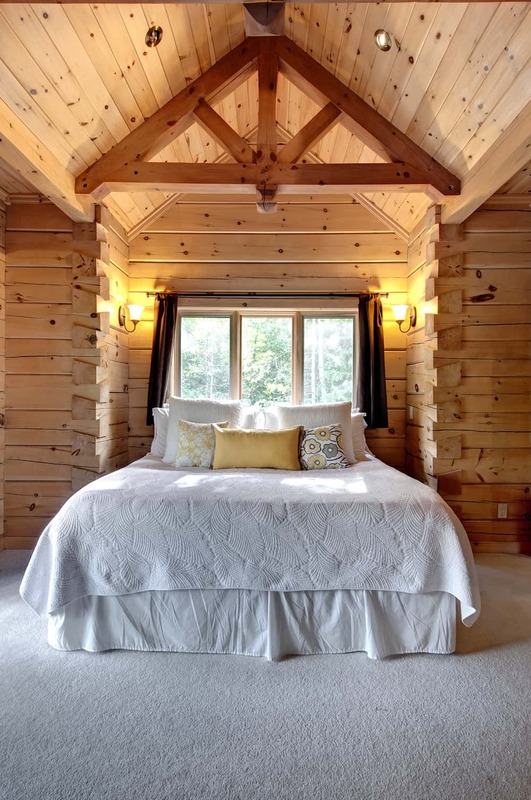 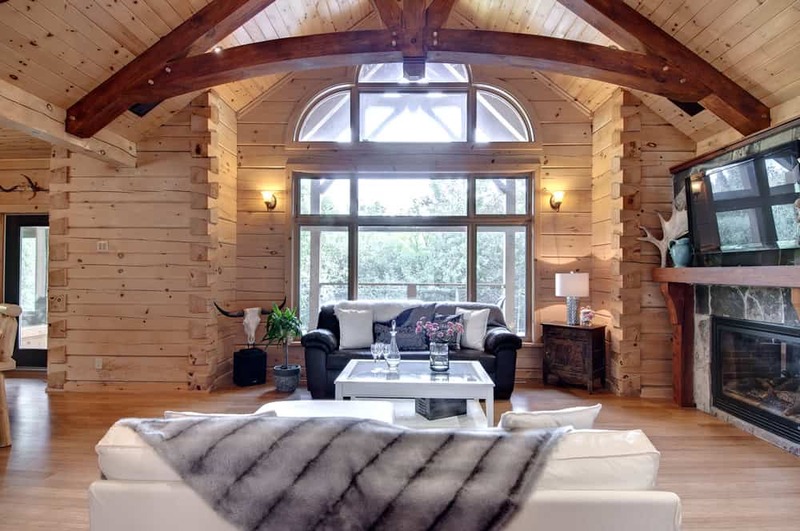 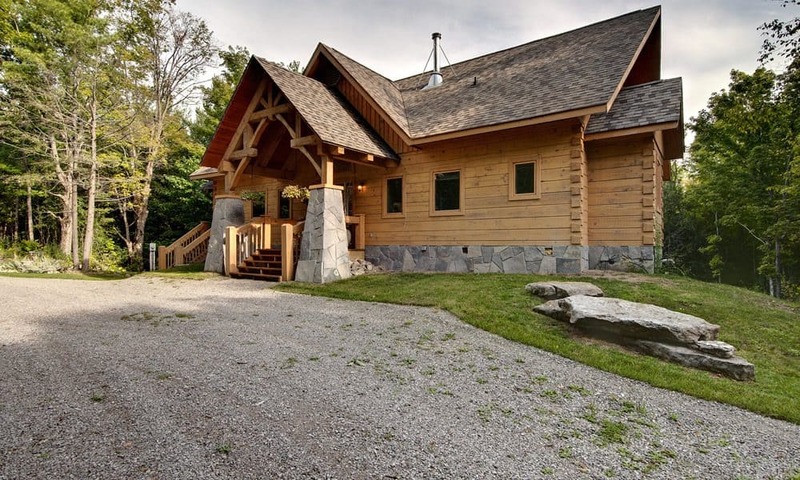 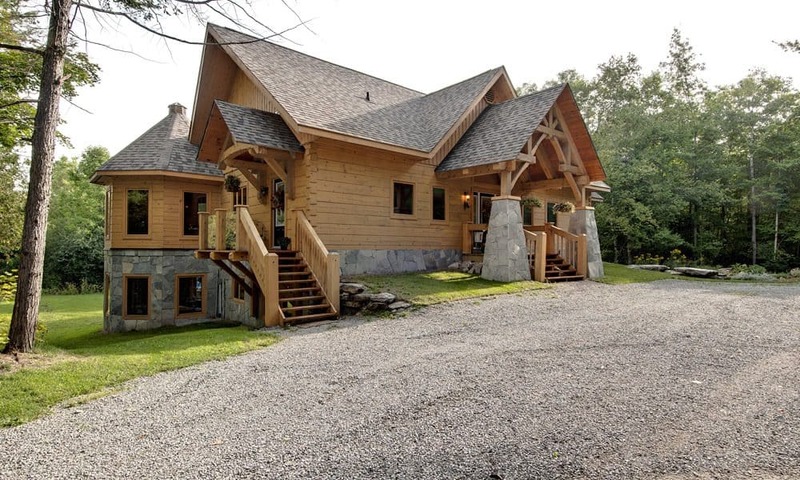 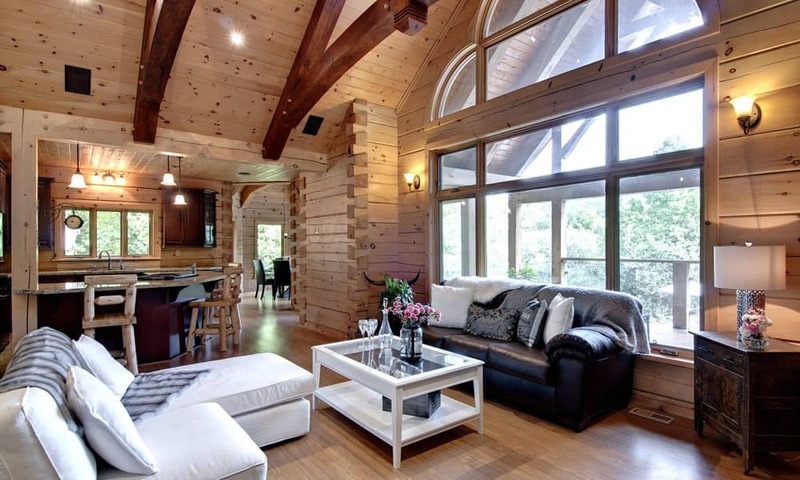 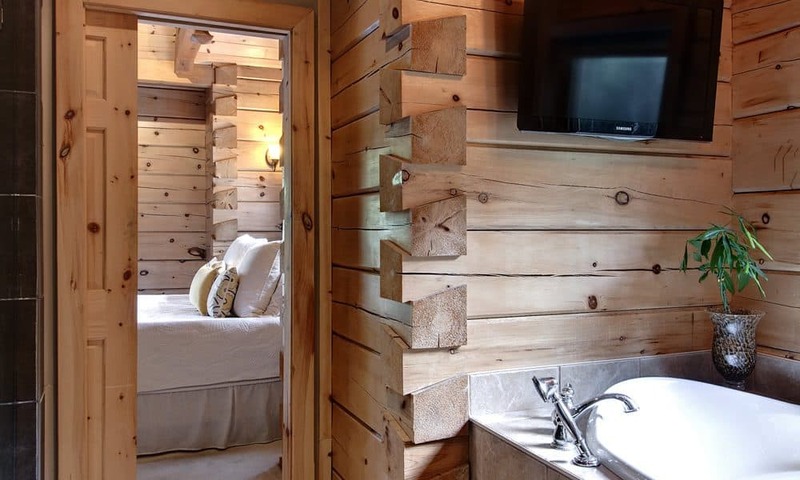 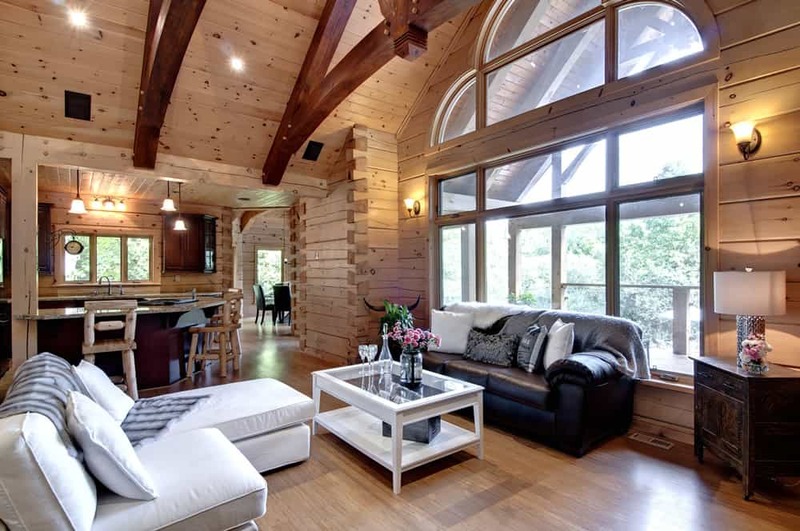 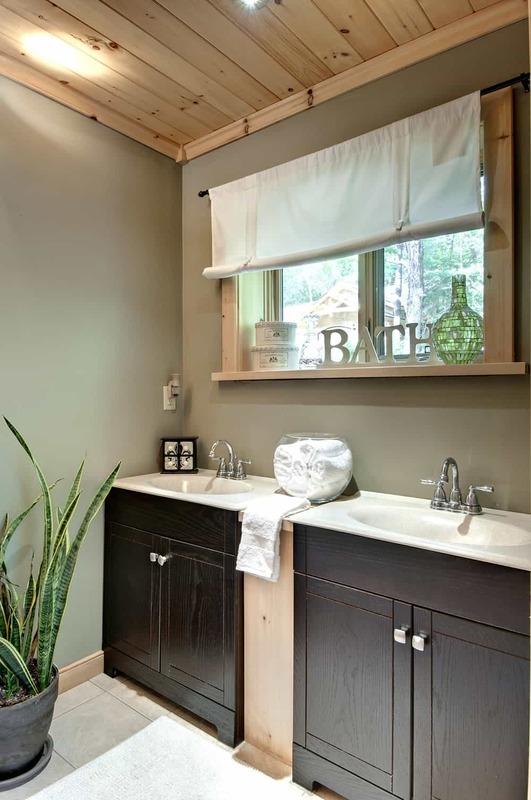 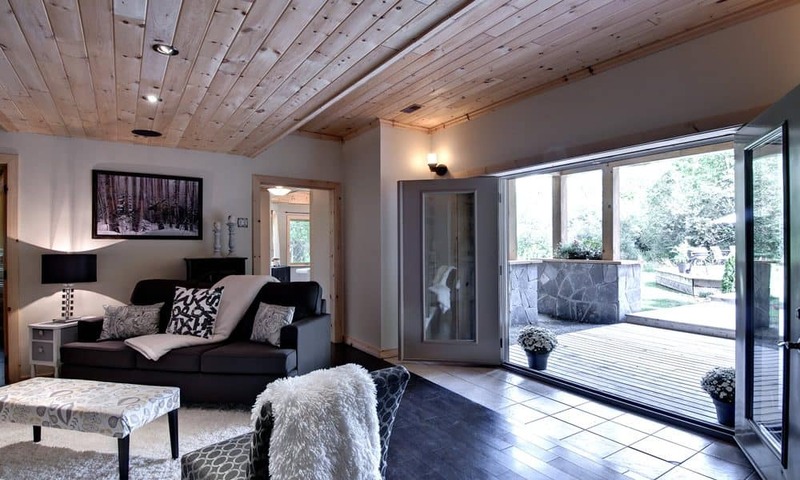 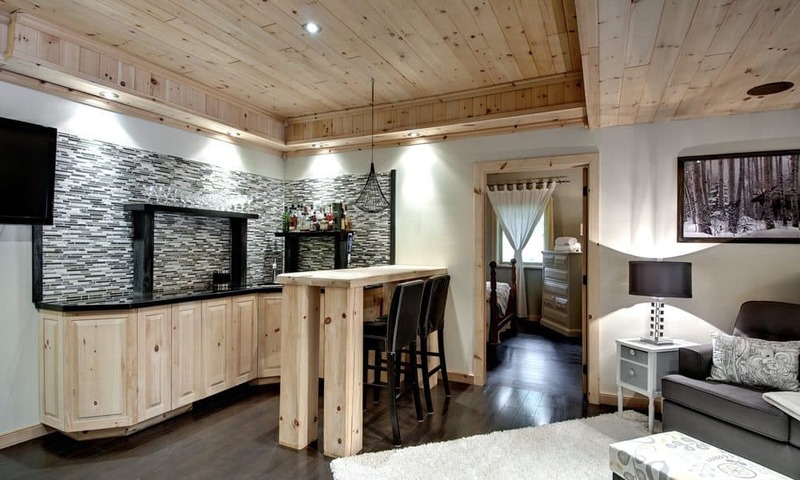 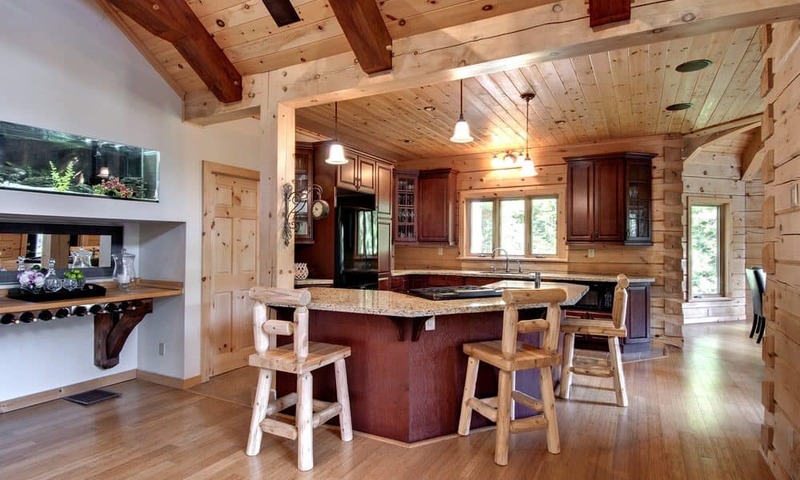 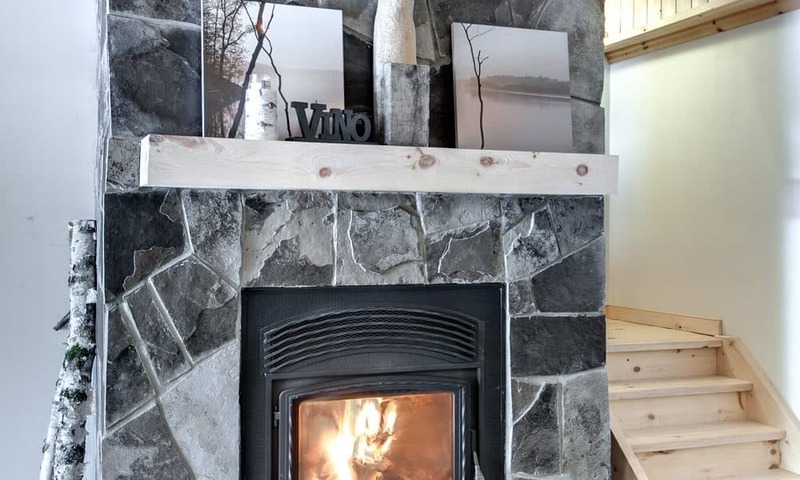 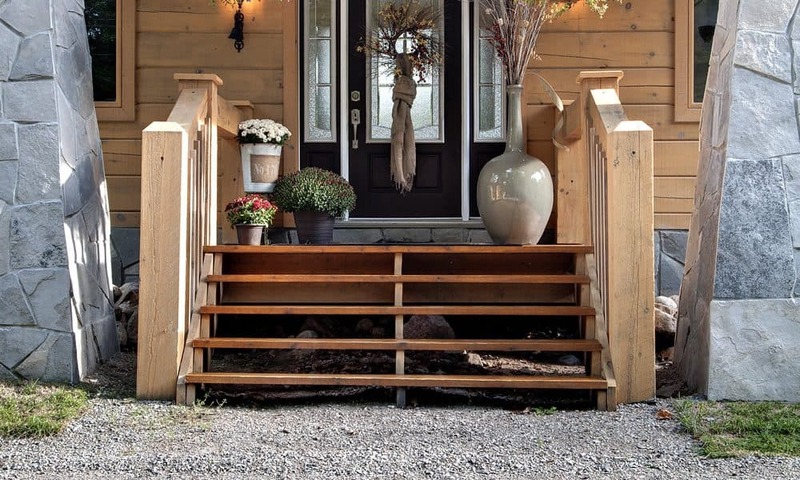 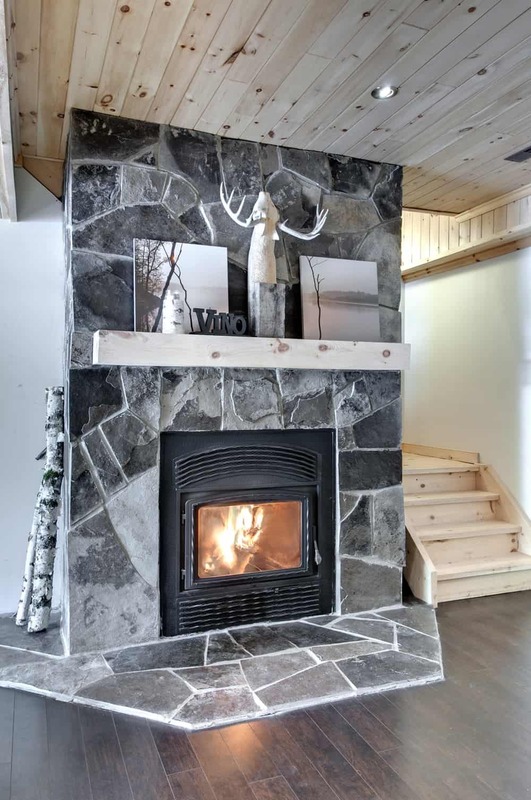 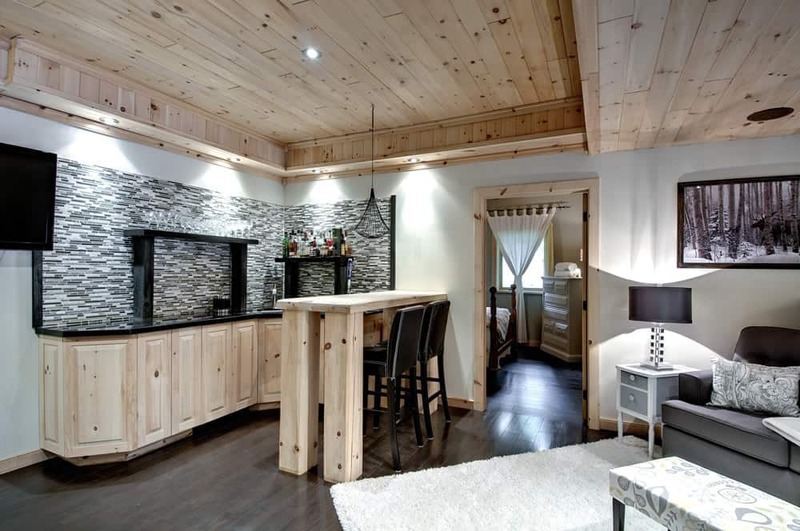 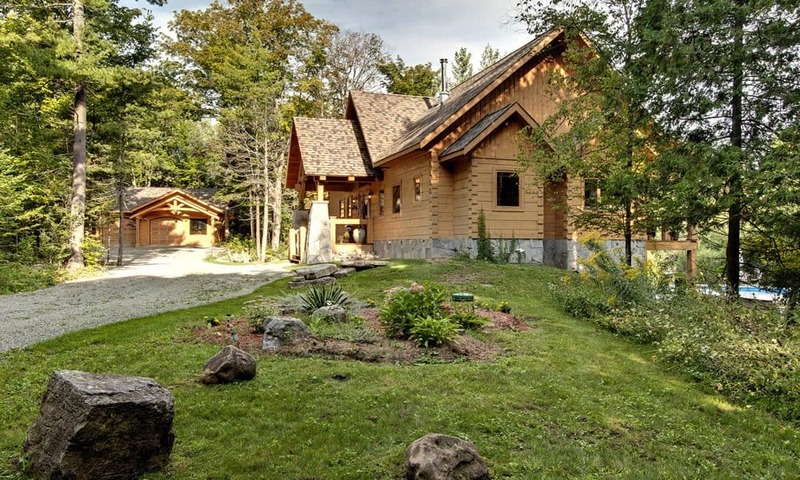 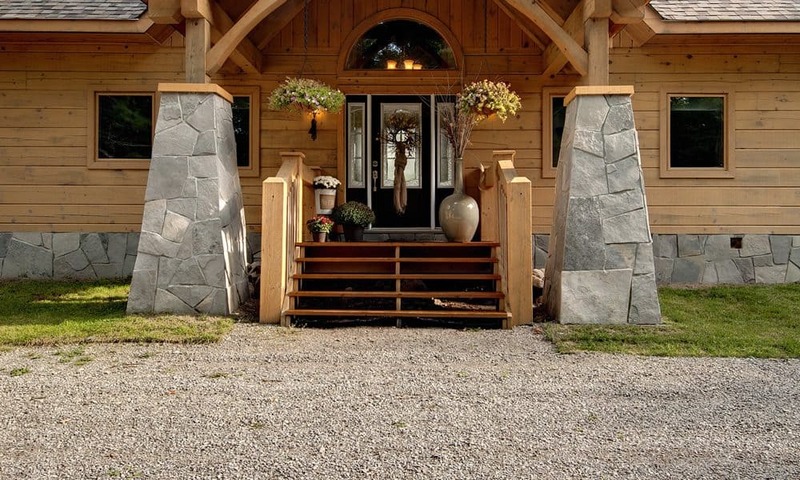 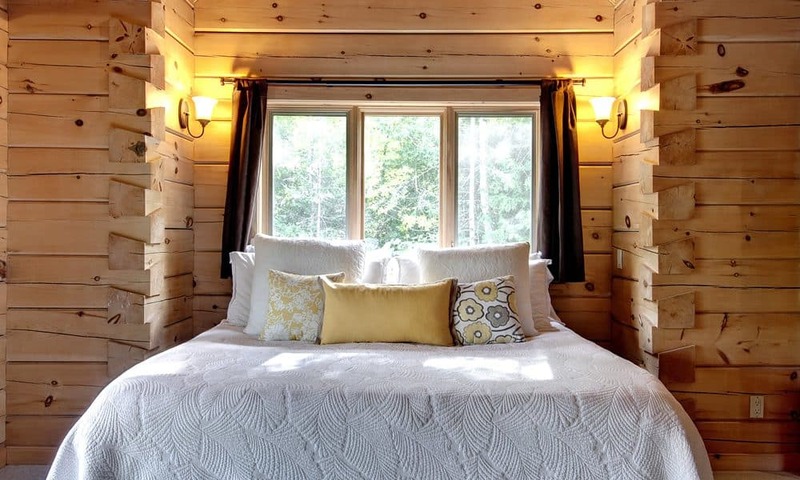 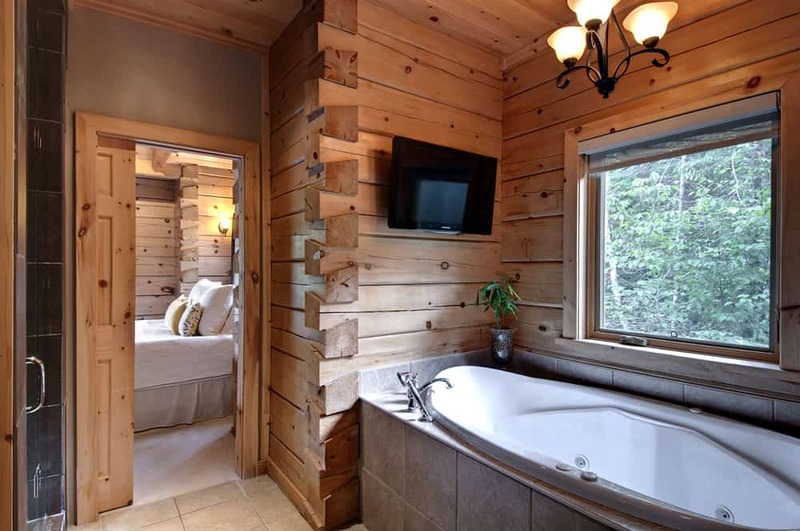 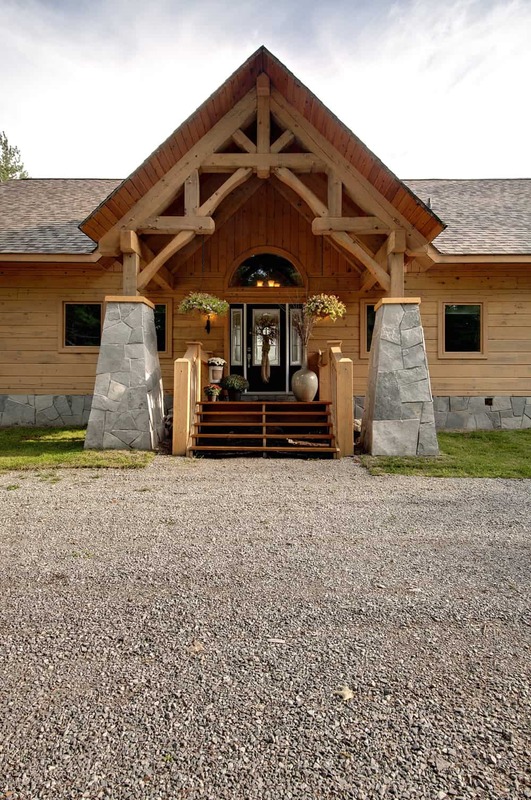 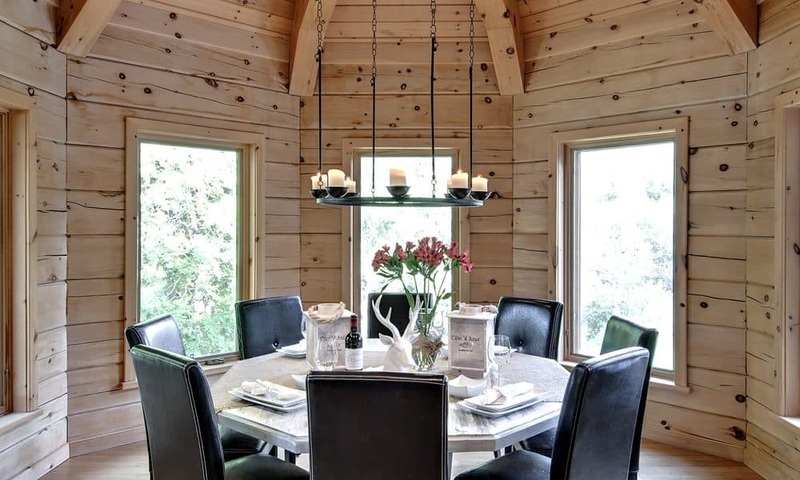 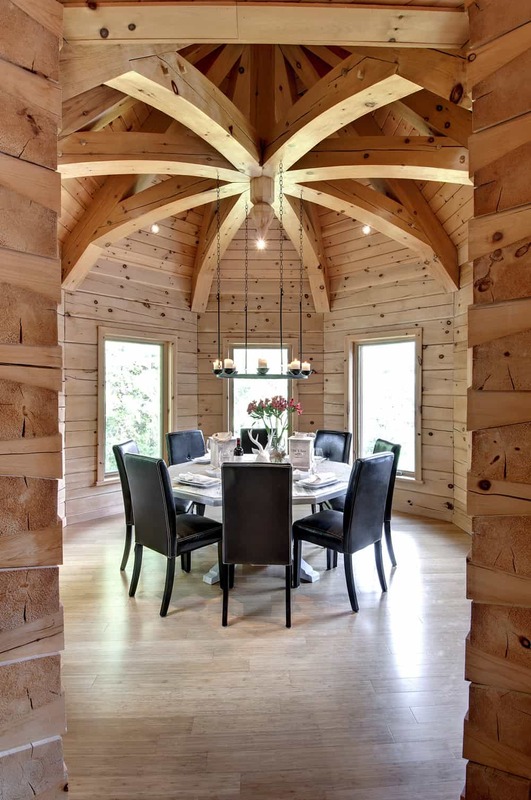 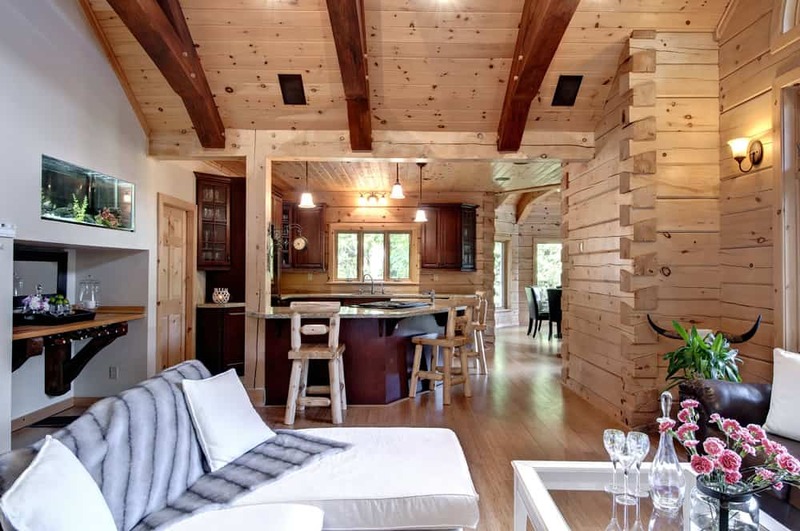 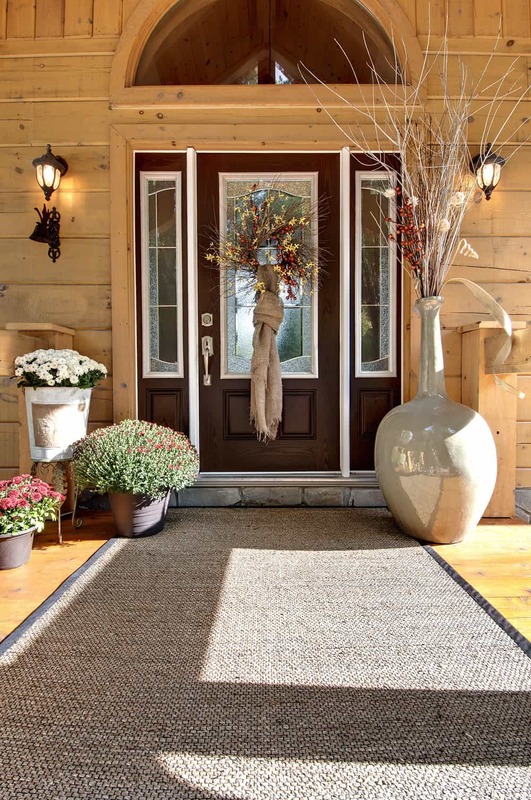 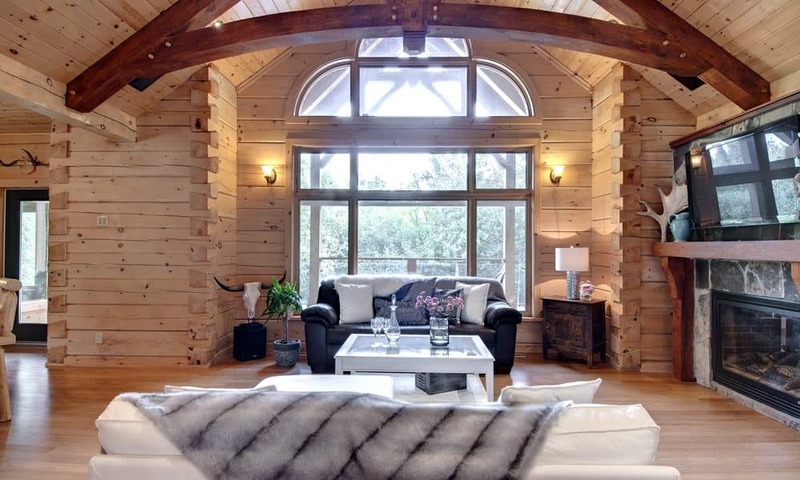 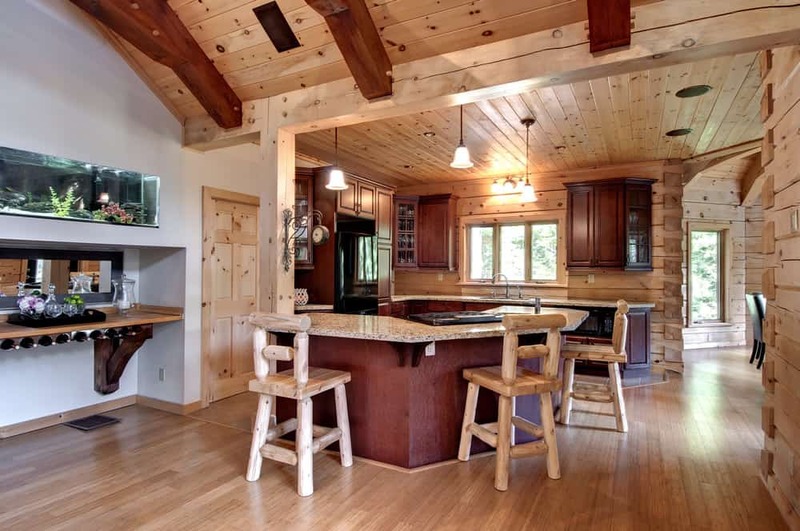 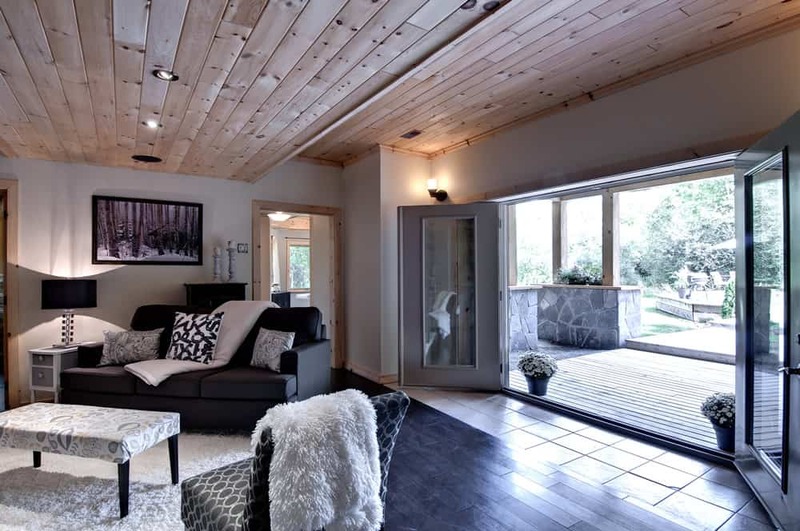 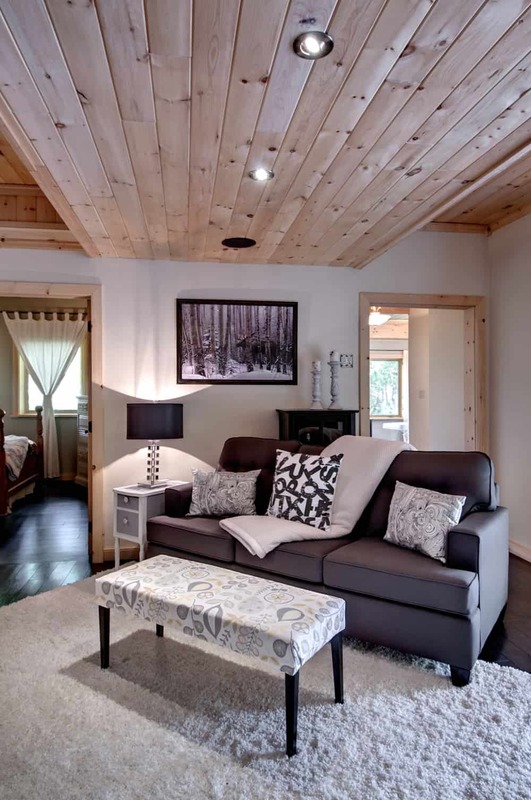 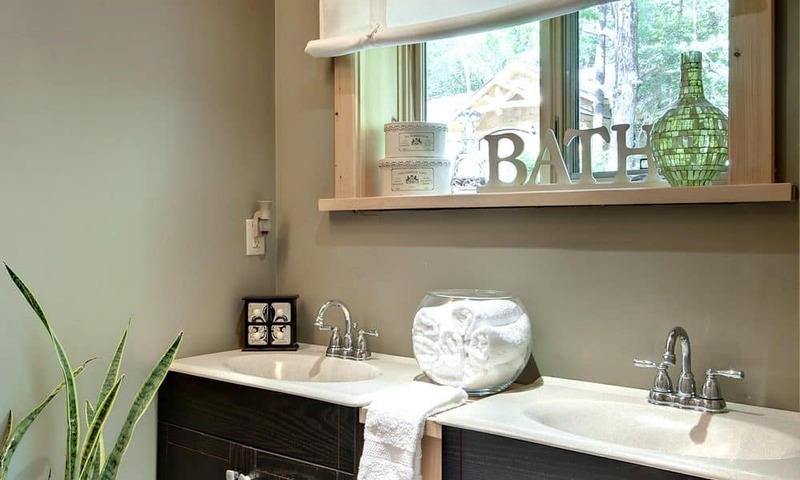 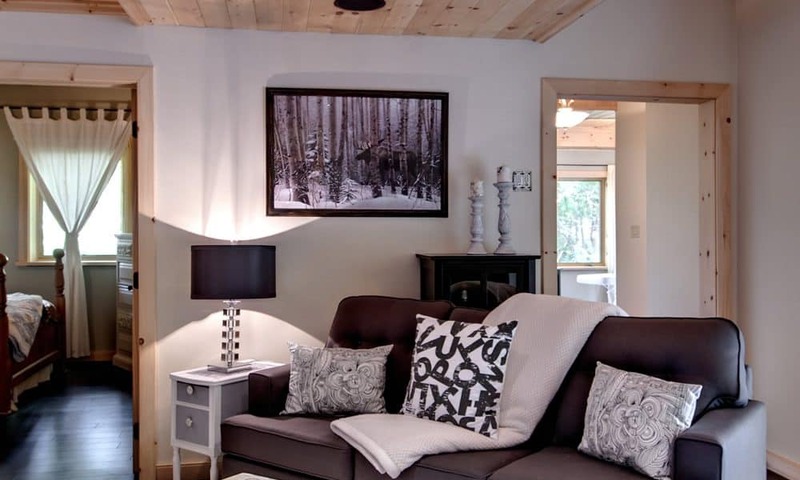 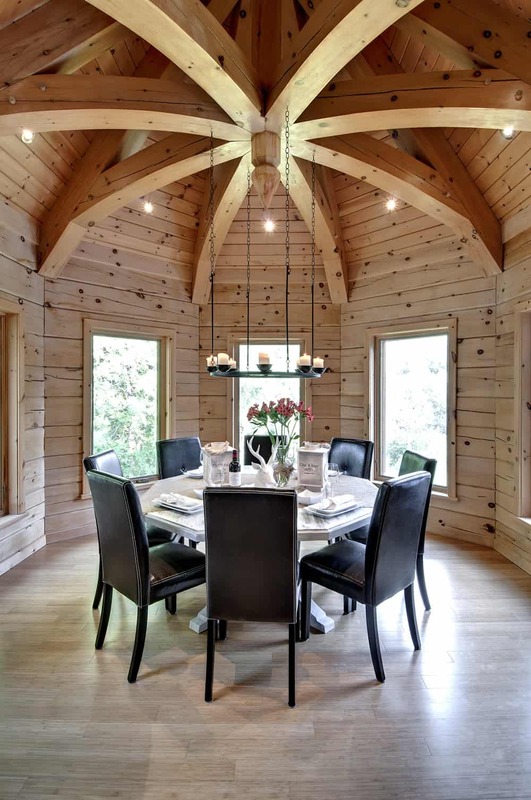 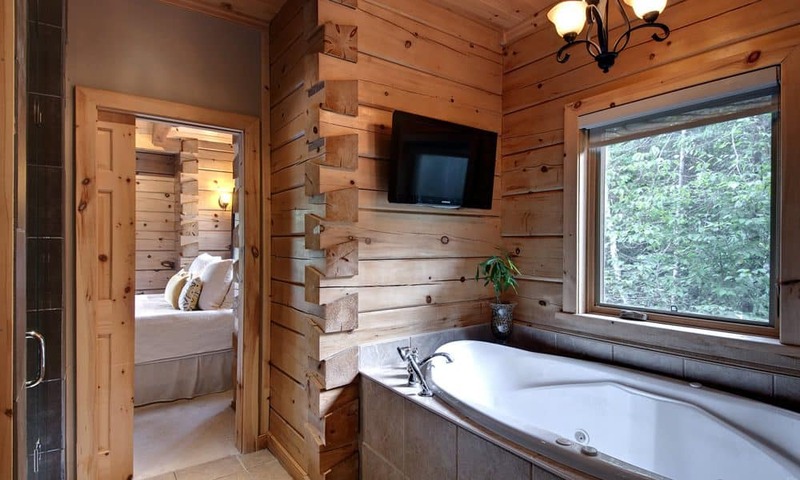 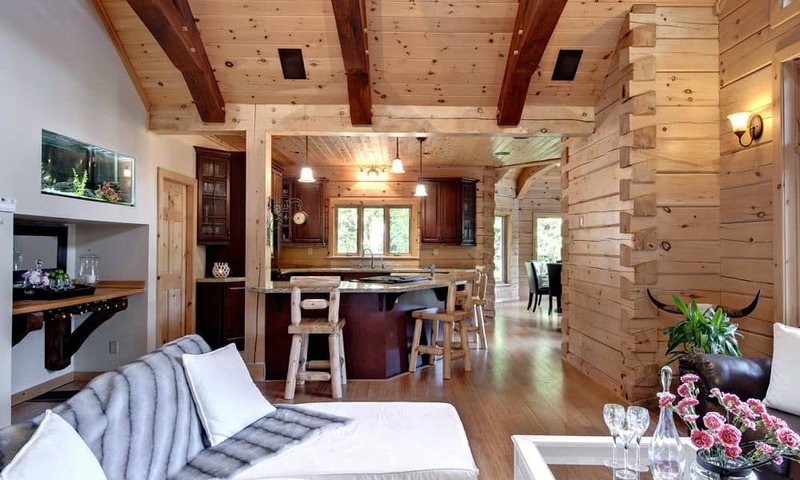 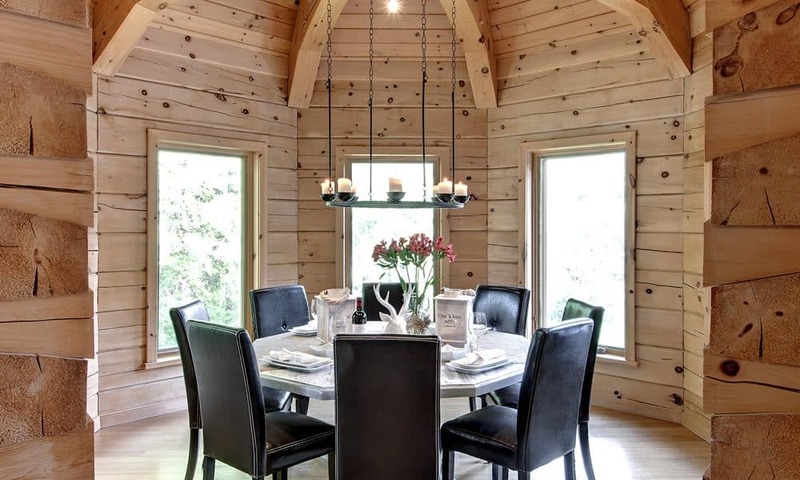 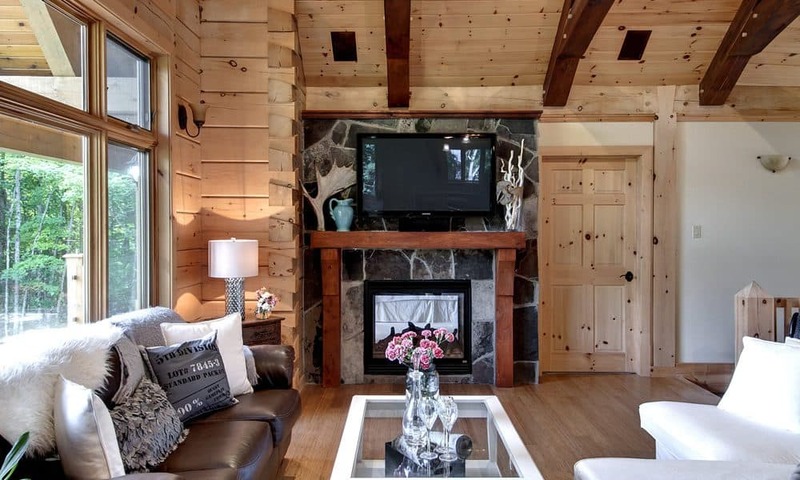 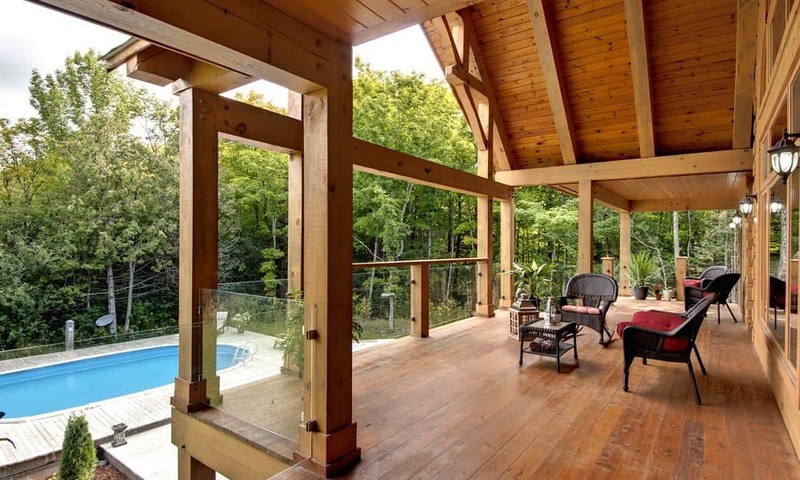 A Log Home Living Best-Of Award Winner! 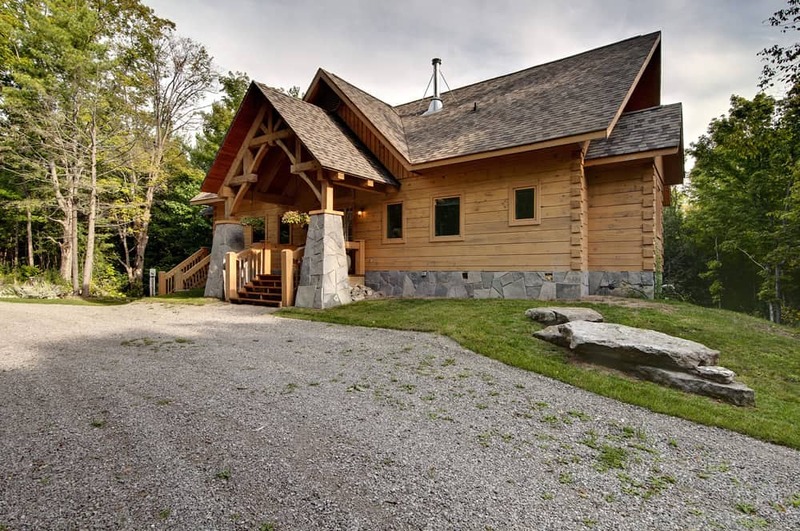 Originally designed and built by our very own Vice-President, Operations, Andy Kinsman – the 2,972 square foot home’s hybrid design features 8 x 12 inch square, white pine logs (always from sustainably managed forests) finished rough on the outside and smooth on the inside with tight fitting dovetail corners that are also an interior highlight, providing a focal point in every room. 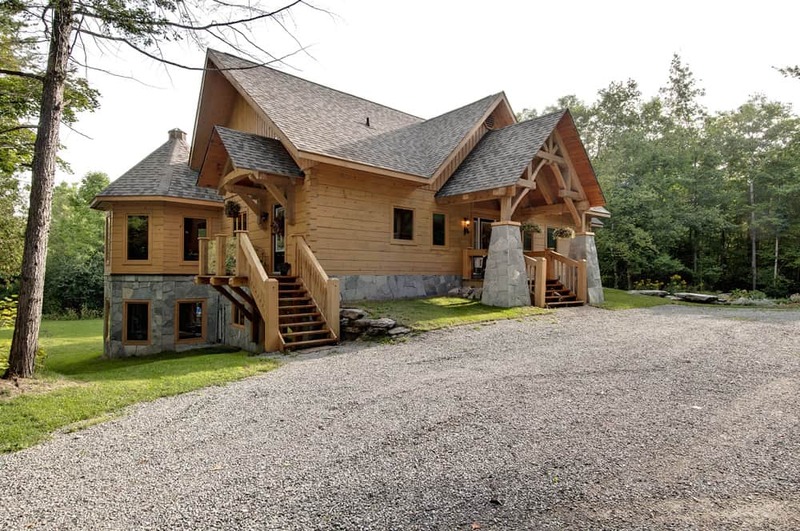 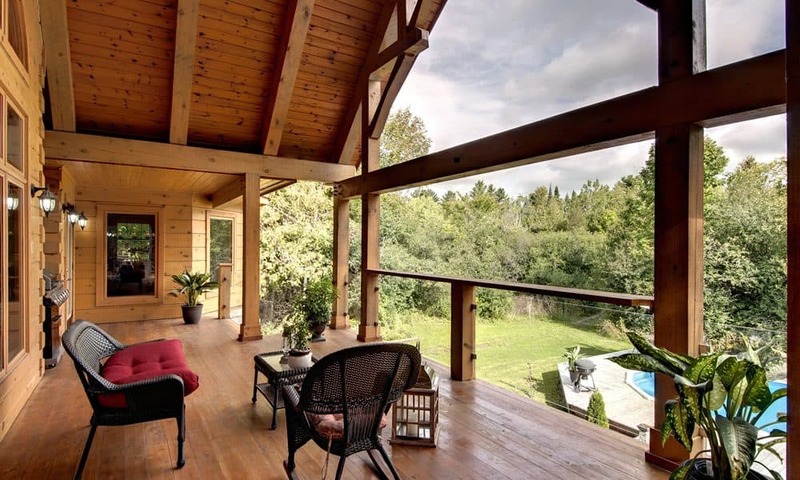 It boasts elaborate timber framing inside and out, making its exterior just as spectacular as its interior and large windows capitalize on views and provide an abundance of natural light. 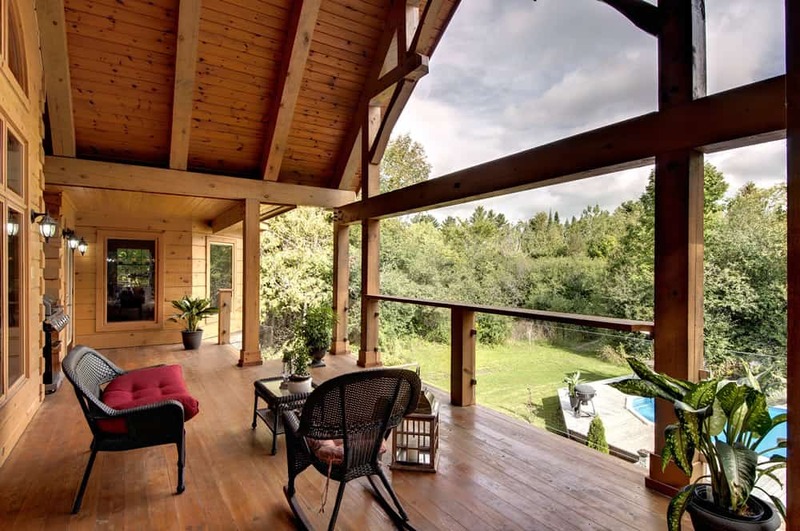 The home features a spacious foyer, a great room with cathedral ceiling and double sided fireplace which opens to the kitchen and leads into a private turreted dining area with a stunning custom timber ceiling truss and windows that capture almost a 360 degree view outside. 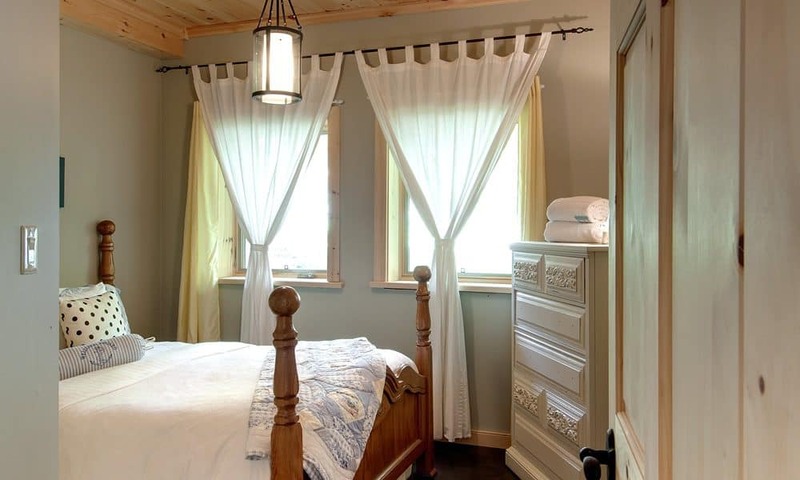 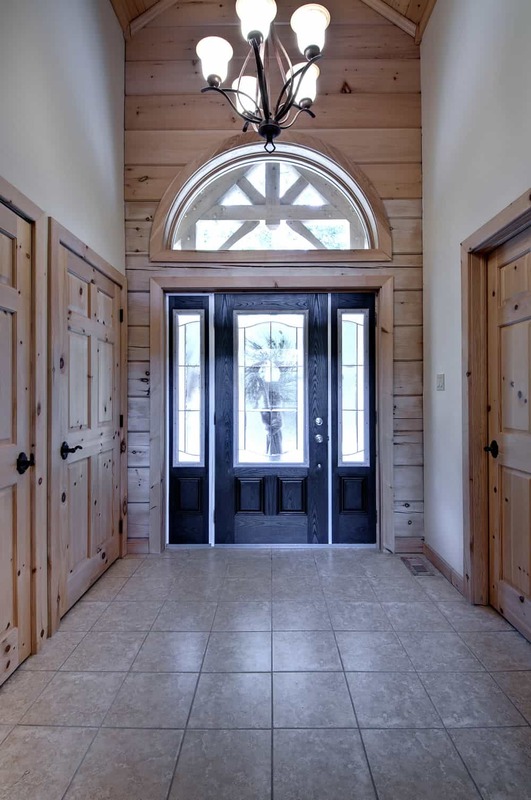 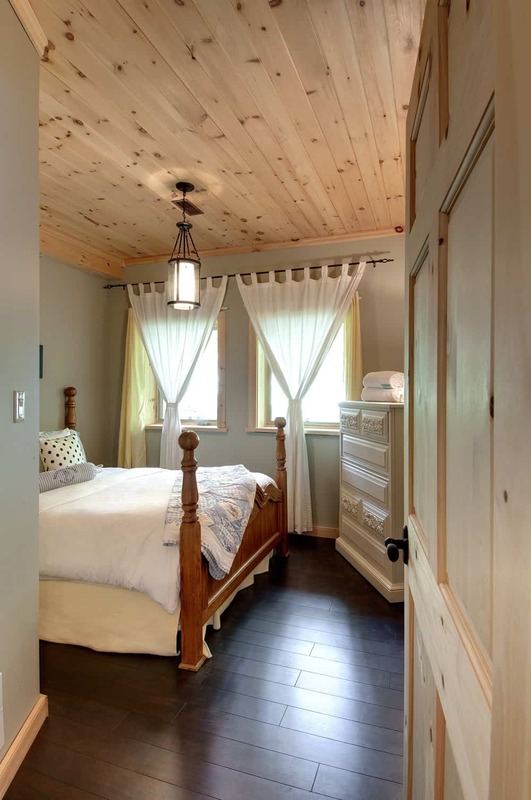 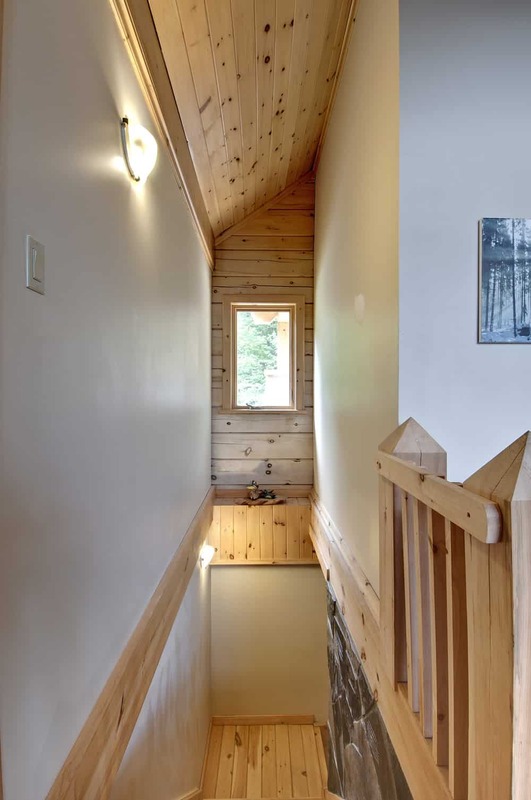 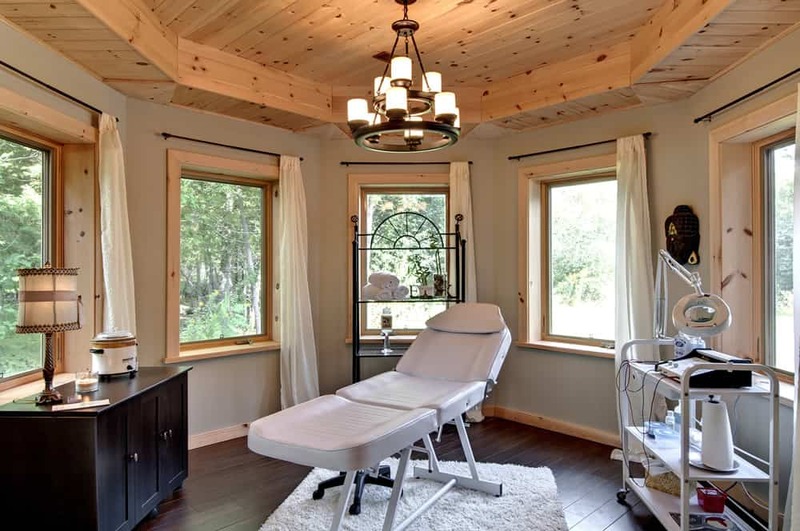 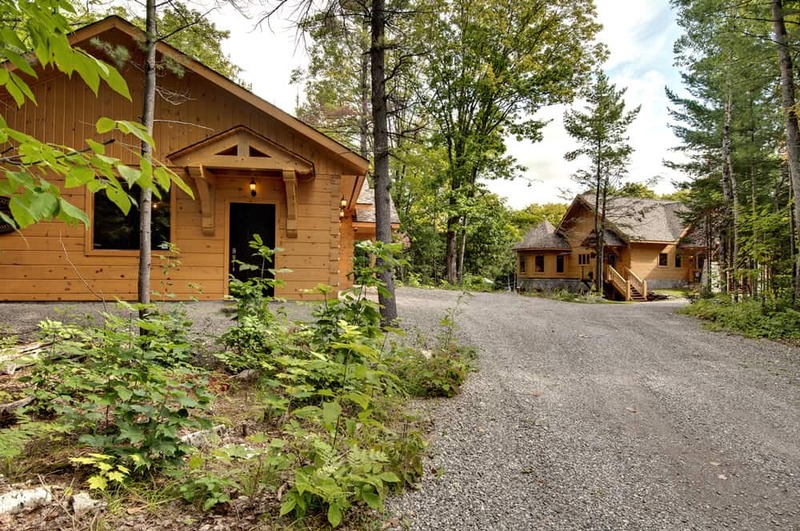 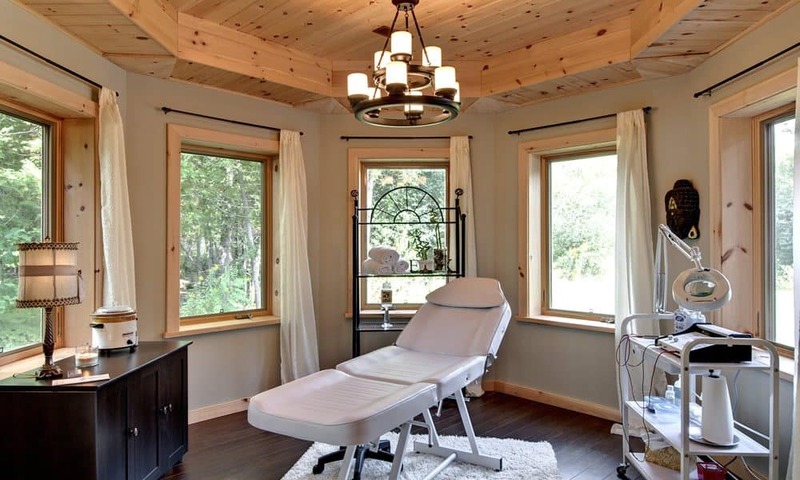 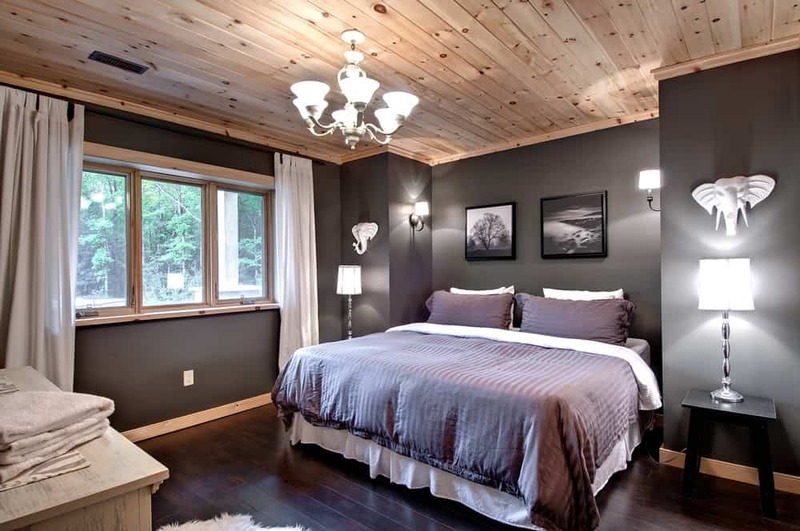 Also on the main floor are a master bedroom with a cathedral ceiling, ensuite bathroom, large walk-in closet, and walk-out to a deck; a 2 piece bathroom and a laundry room. 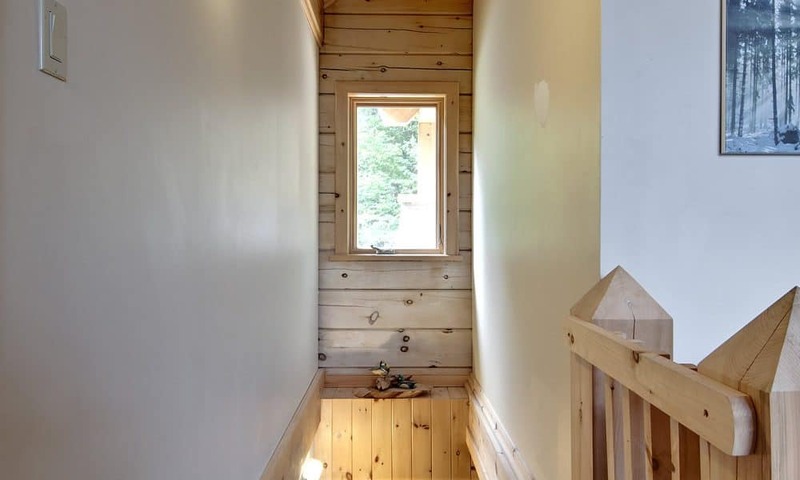 Lower level highlights include 9′ ceilings, lots of windows and a walk-out. 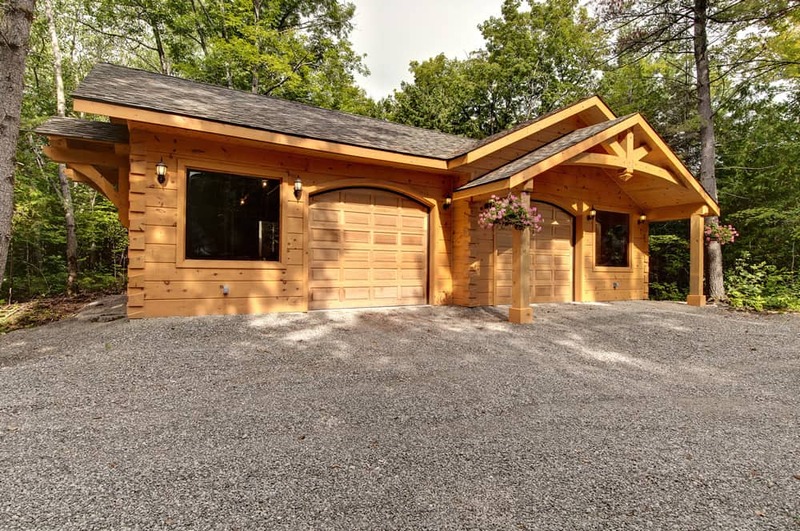 In addition, there is an entertainment area with bar and fireplace; 2 bedrooms; a full bathroom; a home office and a utility/storage room. 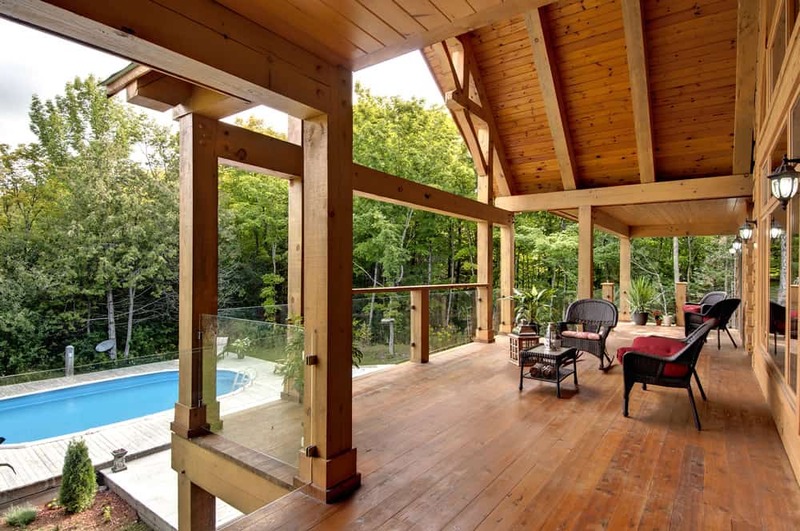 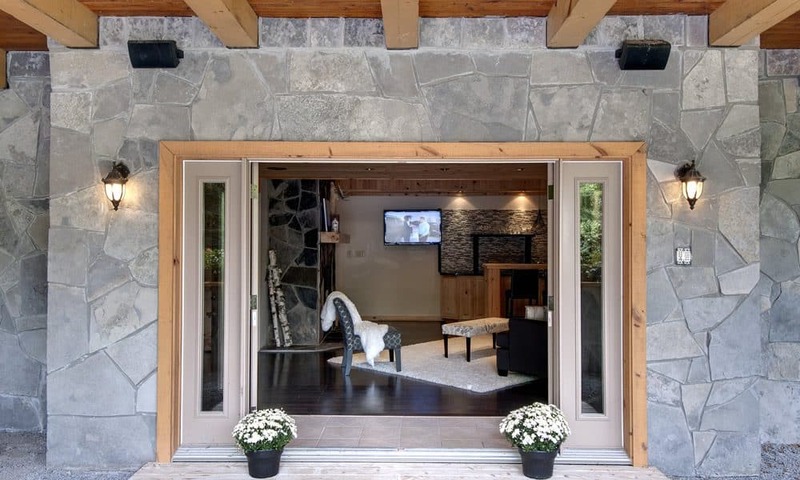 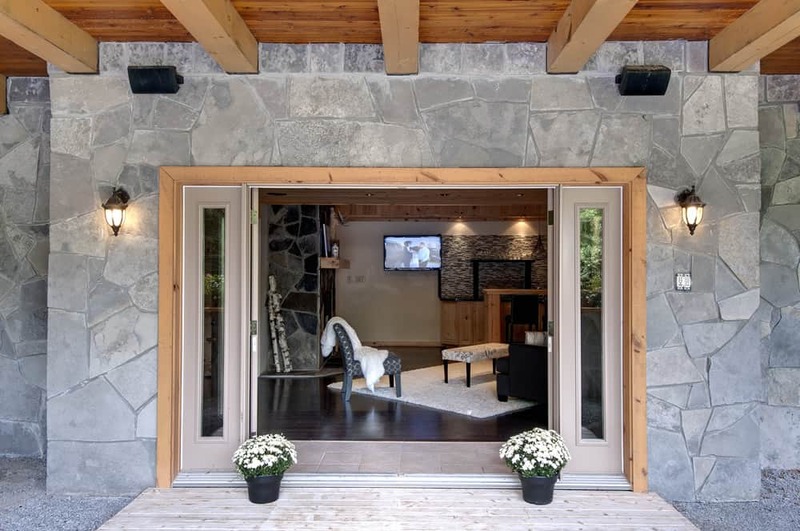 Outside, multiple exposed and covered decks, including a large covered back deck that is ideal for gathering and barbequing in any weather, extend living space. 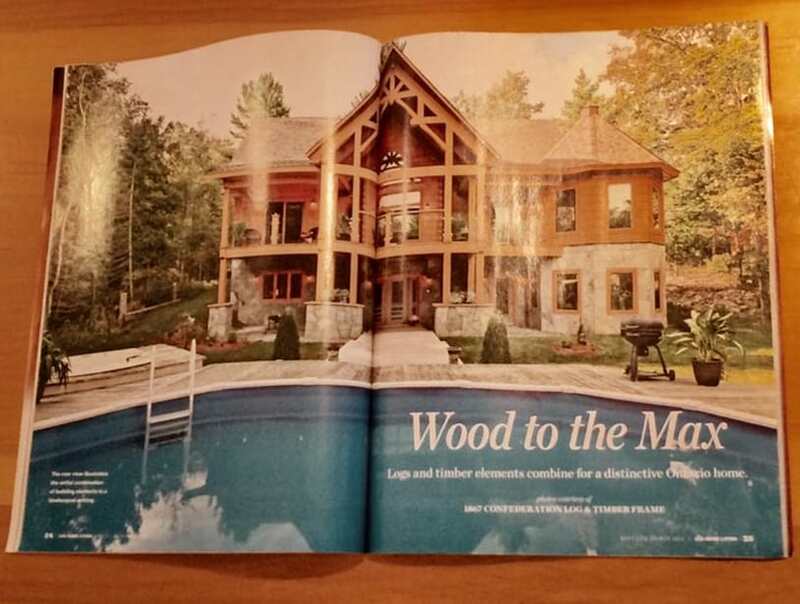 Log Home Living put out their special issue of ‘Years Best Log Homes’ and our Green Woods was declared a winner. 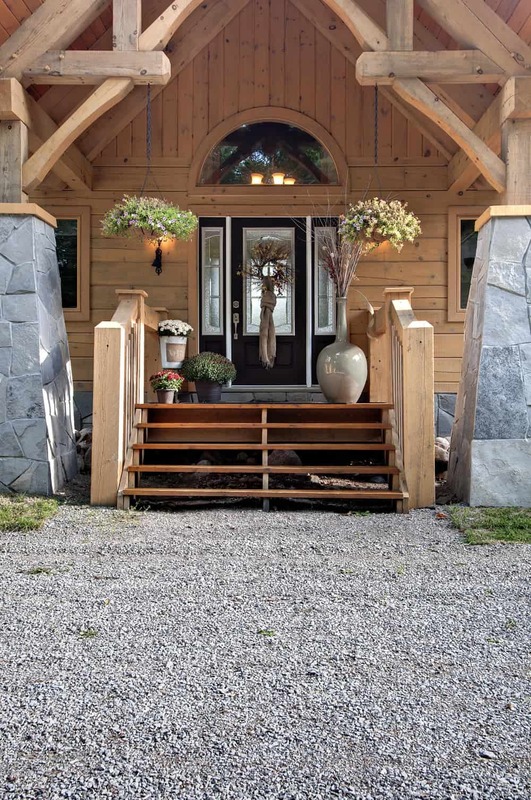 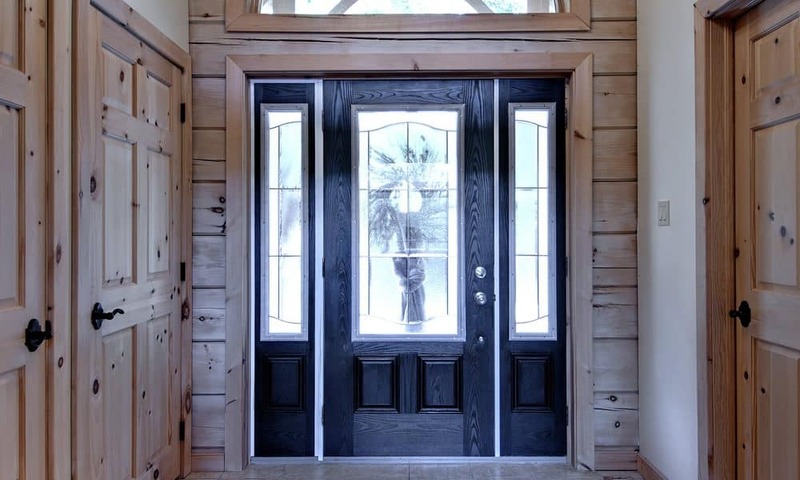 North America’s biggest log home magazine opened a contest free to anyone to enter their best project. 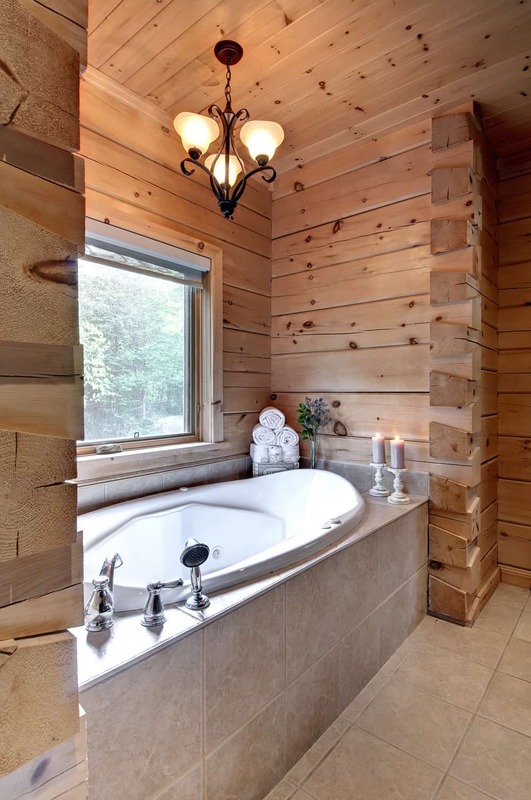 Out of all the entries it was left up to their Facebook fans to vote on. 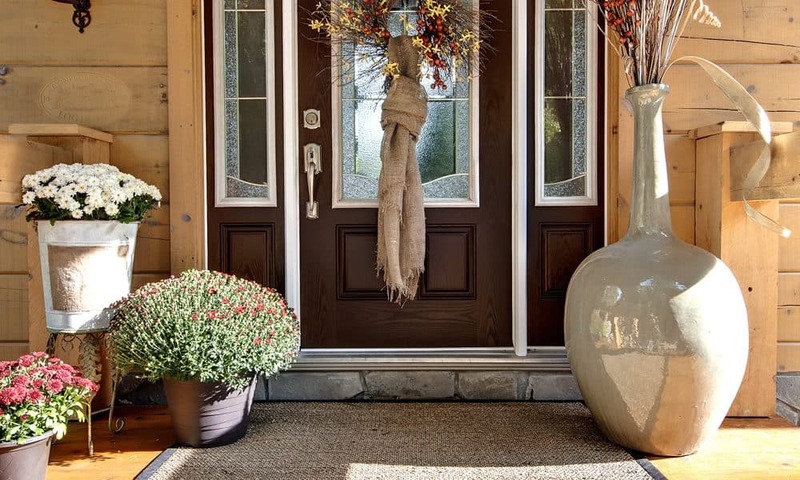 400,000 fans voted our home as one of the best!